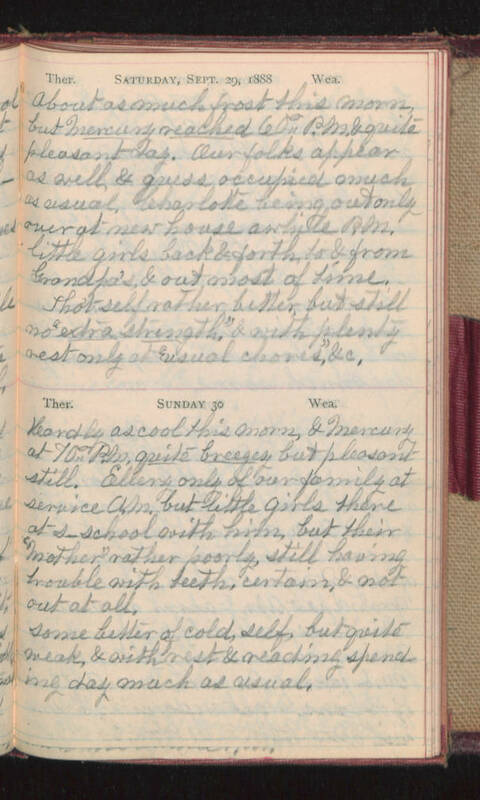 Saturday, Sept. 29, 1888 About as much frost this morn, but Mercury reached 60° P.M. & quite pleasant day. Our folks appear as well, & guess occupied much as usual, Charlotte being out only over at new house awhile P.M. little girls back & forth to & from Grandpa's & out most of time. Tho't self rather better, but still no "extra strength" & with plenty rest only at "usual chores", &c. Sunday 30 Hardly as cool this morn, & Mercury at 70° P.M., quite breezey but pleasant still. Ellery only of our family at service A.M. but little girls there at s-school with him, but their "Mother" rather poorly, still having trouble with teeth, certain, & not out at all. Some better of cold, self, but quite weak, & with rest & reading spending day much as usual.